Welcome to 'Fine Lines', the Friday feature in which we give a sentimental, sometimes-critical, far more wizened look at the children's and YA books we loved in our youth. 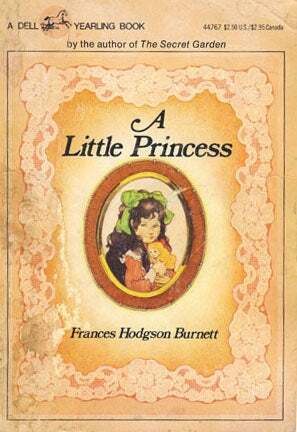 This week, writer / reviewer / blogger Lizzie Skurnick reads 'A Little Princess', Frances Hodgson Burnett's 1905 story of Sara Crewe, who's both a princess and a pauper. There were velvet dressed trimmed with costly furs, and lace dresses, and embroidered ones, and hats with great, soft ostrich feathers, and ermine coats and muffs, and boxes of tiny gloves and handkerchiefs and silk stockings in such abundant supplies that the polite young women behind the counters whispered to each other that the odd little girl with the big, solumn eyes must be at least some foreign princess—perhaps the little daughter of an Indian rajah. "Yes," Sara answered. "...when I play I make up stories and tell them to myself...." ...Emengarde stopped short, staring, and quite losing her breath. "You make up stories!" she gasped. "Can you do that—as well as speak French? Can you?" Sara looked at her in simple surprise. "Why, anyone can make up things," she said...Have you never pretended things?" "No," said Ermengarde. "Never. I—tell me about it." Sara was praised for her quickness at her lessons, for her good manners, for her amiability to her fellow-pupils, for her generosity if she gave sixpence to a beggar out of her full little purse; the simplest thing she did was treated as if it were a virtue, and if she had not had a disposition and a clever little brain, she might have been a very self-satisfied young person. But the clever little brain told her a great many sensible and true things about herself and her circumstances, and now and then she talked these things over to Ermengarde as time went on: "Things happen to people by accident," she used to say. "A lot of nice accidents happened to me. It just happened that I always liked lessons and books, and could remember things when I learned them. It just happened that I was born with a father who was beautiful and nice and clever, and could give me anything I liked. Perhaps I have not really a good temper at all, but if you have everything you want and everyone is kind to you, how can you help but be good-tempered? I don't know"—looking quite serious—"how I shall ever find out whether I am really a nice child or a horrid one. Perhaps I'm a hideous child, and no one will ever know, just because I never have any trials." "Where is Sara Crewe?" Miss Amelia was bewildered. "Sara!" she stammered. "Why, she's with the children in your room, of course." "Has she a black frock in her sumptuous wardrobe? "—in bitter irony. "A black frock?" Miss Amelia stammered again. "A black one?" "She has frocks of every other color. Has she a black one?" Miss Amelia began to turn pale. "No—ye-es!" she said. "But it is too short for her. She has only the black velvet, and she has outgrown it." "Go ahead and tell her to take off that preposterous pink silk gauze, and put the black one on, whether it is too short or not. She has done with finery!" Then Miss Amelia began to wring her fat hands and cry. "Oh, sister!" she sniffed. "Oh, sister! What can have happened?" Miss Minchin wasted no words. "Captain Crewe is dead," she said. "He has died without a penny. That spoiled, pampered, fanciful child is left a pauper on my hands." "You see," she said, "there could be a thick, soft blue Indian rug on the floor; and in that corner there could be a soft little sofa, with cushions to curl up on; and just over it could be a shelf full of books so that one could reach them easily; and there could be a fur rug before the fire, and hangins on the wall to cover up the whitewash, and pictures. They would have to be little ones, but they could be beautiful; and there could be a lamp with a deep rose-colored shade; and a table in the middle, with things to have tea with; and a little fat copper kettle singing on the hob; and the bed could be quite different. It could be made soft and covered with a lovely silk coverlet. It could be beautiful. And perhaps we could coax the sparrows until we made such friends with them that they would come and peck at the window and ask to be let in." "I can't bear this," said the poor child, trembling. "I know I shall die. I'm cold; I'm wet; I'm starving to death. I've walked a thousand miles today, and they have done nothing but scold me from morning until night. And because I could not find that last thing the cook sent me for, they would not give me any supper. Some men laughed at me because my old shoes made me slip down in the mud. I'm covered with mud now. And they laughed. Do you hear?" "You are nothing but a doll!" she cried; "nothing but a doll-doll-doll! You care for nothing. You are stuffed with sawdust. You never had a heart. Nothing could make you feel. You are a doll!" "Suppose I had dry clothes on," she thought. "Suppose I had good shoes and a long thick coat and merino stockings and a whole umbrella. And suppose—suppose—just when I was near a baker's where they sold hot buns, I should find sixpence—which belonged to nobody. Suppose, if I did, I should go into the shop buy six of the hottest buns and eat them all without stopping." ....it was actually a piece of silver—a tiny piece trodden upon by many feet, but still with spirit enough left to shine a little. Not quite a sixpence, but the next thing to it—a four-penny piece. ....and then if you believe me, she looked straight at the shop directly facing her. And it was a baker's shop, and a cheerful, stout, motherly woman with rosy cheeks was putting into the window a tray of delicious newly baked hot buns, fresh from the oven—large, plump shiny buns, with currants in them. ..."If I'm a princess," she was saying—"if I'm a princess—when they were poor and driven from their thrones—they always shared—with the populace—if they met one poorer and hungrier than themselves. They always shared. Buns are a penny each. If it had been sixpence I could have eaten six....." ...See," she said, putting the bun in the ragged lap, "this is nice and hot. Eat it, and you will not feel so hungry." The child started and stared up at her, as if such sudden, amazing good luck almost frightened her; then she snatched up the bun and began to cram it into her mouth with great wolfish bites. "Oh, my! Oh, my!" Sara heard her say hoarsely, in wild delight. "Oh, my!" Sara took out three more buns and put them down. The sound in the hoarse, ravenous voice was awful. "She is hungrier than I am," she said to herself. "She's starving." But her hand trembled when she put down the fourth bun. "I'm not starving," she said—and she put down the fifth.